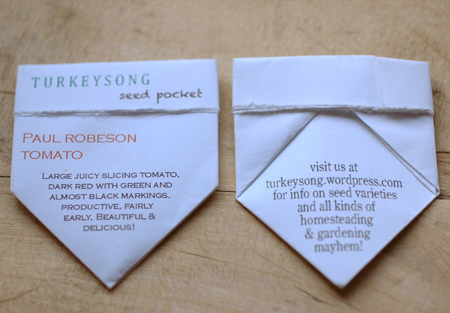 At some point a year or two ago, I had to come up with a folded packet/envelope design so I could give away the seeds that I save at farmer’s markets, scion exchanges and places like that. I like giving away seeds. I often give away too many and end up kicking myself, but it is so compelling for some reason! The first thing that came to mind was those little paper packets called bindles that cocaine used to come in back in the 80’s. Learning to fold bindles was about the only real good I ever got out the stuff. Cocaine was around a lot back then, but I had little use for it. I think I was more interested in the bindles than the coke. I did so little of it that I couldn’t remember how to make those little folded paper bindles almost 30 years later. So, anyway, no bindles. I had to improvise. I’m not sure why I didn’t just look for instructions on the internet, but I’m glad I didn’t. I had recently come up with an origami container for roasted baynuts that was pretty nifty, so I was emboldened to the task and began folding away fearlessly. I already knew I wanted it to be a quarter sheet or smaller. The result after a few minor adjustments is this origami dubbed “seed pocket” for obvious reasons. It came out with some neat unexpected features. The back tabs lock together in a really neat way to keep the packet closed. If stuffed super full it may open at the back (though it’s still unlikely to spill seeds) but then you can just make a larger one out of a full sheet instead of a quarter sheet. I prefer to tear the paper after creasing, because the torn edges appear under the title, which looks cool and more handcrafted-like. there are also a lot of squares and half square triangles formed, so the proportions are pleasing to an OCDish person fixated on symmetry, like me. These are very seed tight and unlikely to leak even small seeds like poppy. In fact, I just packed up some tiny shirlie poppy seeds last night. I’m not so sure about super teeny weeny tiny seeds like tobacco and lobelia, but otherwise, they’re pretty dang tight! I’ve got one laid out in adobe illustrator for each of the seed varieties that I save regularly, with names, short descriptions and a nudge in the direction of my blog to pick up web traffic. They serve a little like business cards and are very popular. It’s a lot of folding, but I actually like folding them while watching a movie or just thinking about stuff. It’s sort of addictive. I’ve probably folded thousands by now. This template is for four small seed pockets per 8.5 x 11 inch sheet. 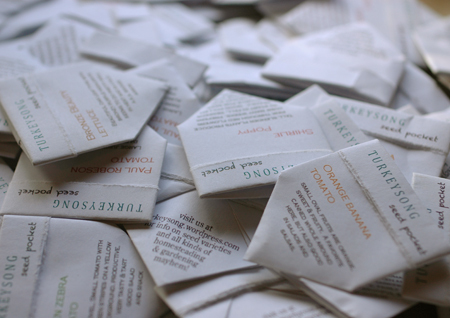 I haven’t made a full sheet template, but I do use the same origami design for making an occasional large seed packet. If you use the template, I’d appreciate the small favor of leaving the blip on the underside of the flap so people can find the template and this post and my blog. Thanks! So, save some seeds this year! If you haven’t saved seed before, tomatoes are an easy place to start. They rarely cross with each other. Just take a non-hybrid tomato that you like, squish the seeds into a bowl, let it ferment for a day or two to dissolve the pulp, wash and drain several times to clean the seeds, and dry on a piece of paper in the shade until thoroughly dry. And don’t miss my one other youtube video ever, the epic guinea pig munch off!